This report may not be quite so timely, but my last visit to the beloved East Village revealed that Snack Dragon has moved off the sidewalk shack and onto 199 East 3rd Street (Map). Their menu expanded slightly, but I didn't have time to stop for a snack (ha! get it?) and sample the goods. The picture says it all. 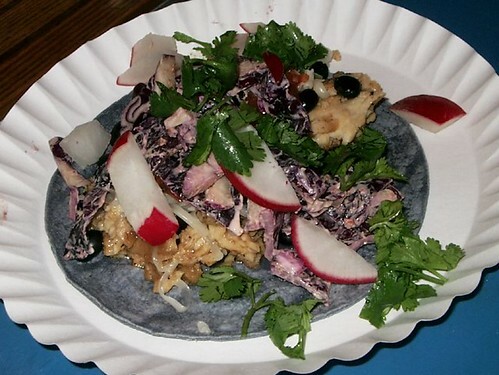 There are radishes on my fish taco. For years, I’ve tried to get used to radishes, and I’ve made incredible progress. Still, I’m not quite there. It’s not you. It’s me. Maybe one day things will work out between us. Snack Dragon surprised me in a number of ways. The modest menu offering (4 kinds of tacos) is straight to the point. Of these 4, 1 is chicken verde. Yes! They only give you 1 corn tortilla. I think 2 is standard. 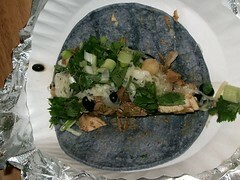 The corn tortilla is blue. Did you see that? Blue! It kind of fell apart before I got it home - this picture was taken before travel. While chicken verde is hard to come by, the single corn tortilla made it structurally unsound. If you don't object to the fork and knife, the chicken verde taco from Snack Dragon is a winner, even at $3.25 each. This Snack Dragon meal was rated: 7.1. 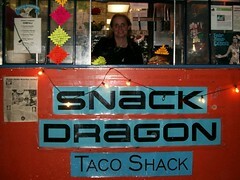 Snack Dragon is the ultimate in taco shacks. Why? It's a shack. There's enough room for one person inside, and there are no wheels, which separates it from a taco cart. 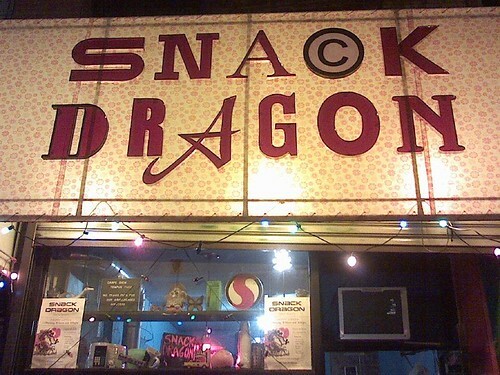 As a new addition to New York's East Village neighborhood in early 2005, Snack Dragon sits on Avenue B and 3rd Street (Map), offering late night snacks to both the drunk and the hungry. To the surprise of Burrito Blog, snack dragon does not sell burritos - only tacos. No matter, we're already here.